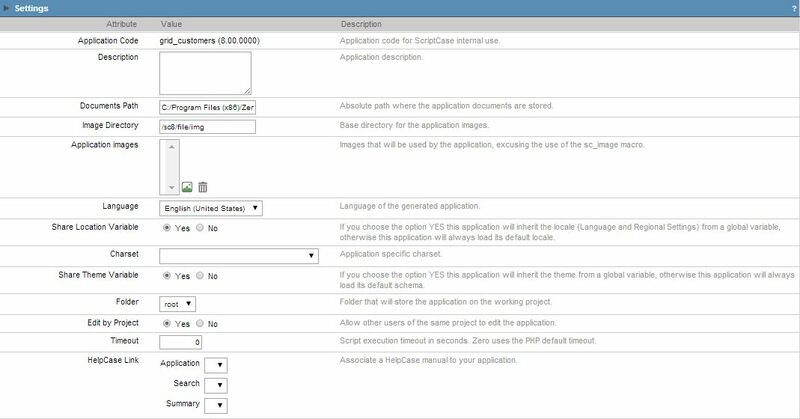 In this configuration there are common attributes to the created applications through ScriptCase, in the following we will describe these attributes. Image1: Interface of Application Configuration. Application	code - Application code determined in the moment of the application creation, this code can be renamed through the main menu. Description - This field can be used to describe the application objectives. Documents Path - The absolute path where the application documents are stored. Image Directory - The base directory where the application images are stored. Application Images - To use in business rules implemention, without using macro sc_image. Language - Language of the generated application, all the hints and messages will be put inside the chosen language. Share location variable - Shares location with other applications based on the session values. Use old PDF exporter - Option to use the old pdf exporter (in java) or the new exporter (webkit). Charset - Defines a specific charset used in the application. Share theme variable - Shares theme with other applications based on the session values. Edit Project - Allows that other users of the group edit the application. Timeout - Time of execution timeout in seconds. Zero is the standard value of the PHP. HelpCase Link - Associate a this application to a page of project documentation. Image 2: Interface of Error Settings. Script Error - Allow to show the information of the script and the line where the error occurred. SQL Error - Allow to show the SQL command which originated the error. Debug Mode - Run the application in debug mode, showing the SQL Command in the moment of its using. Ajax Error Output - It opens a window with the ajax output.